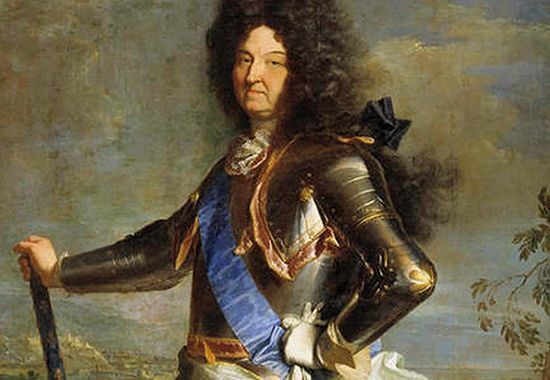 King Louis XIV (1638-1715) was terrified of bathing; he’s said to have taken only three baths in his life. That fear was shared by the noblility in the 17th Century – it ws thought that was thought that water spread disease (so the less you bathed, the less vulnerable you were). Yet Versailles was seriously fragrant. Throughout the Palace, bowls were filled with flower petals, to sweeten the air. Furniture was sprayed with perfume. Even the fountain And visitors – probably a defensive move, when hygiene was pretty scarce – were sprayed with perfume, on entering the Palace. In fact, the air of the gilded salons at the French court was so fragrant that the French court became known as ‘the Perfumed Court’. Louis took the trend for perfumery to new heights, by commissioning his perfumer to create a new scent for each day of the week. He insisted on having his shirts perfumed with something called ‘Aqua Angeli’, composed of aloes-wood, nutmeg, storax, cloves and benzoin, boiled in rosewater ‘of a quantity as may cover four fingers’. It was simmered for a day and night before jasmine and orange flower water and a few grains of musk were added. Like some kind of early fabric conditioner, it was used to rinse Louis’s shirts. The King also arranged for a pavilion in blue and white to be built at Versailles for love-making, so that between amorous moments he could fill his lungs with the scent of stocks, tuberose and white jasmine. It became the custom for people of rank to superintend the making of the special fragrances they favoured. The Prince of Condé, for instance, always had his favourite snuff scented in his presence. The Duchesse d’Aumont’s scent was known as ‘à la Maréchale’ (she was married to the Marshall of France), and was created from coriander, sweet flag (iris) and nut grass. 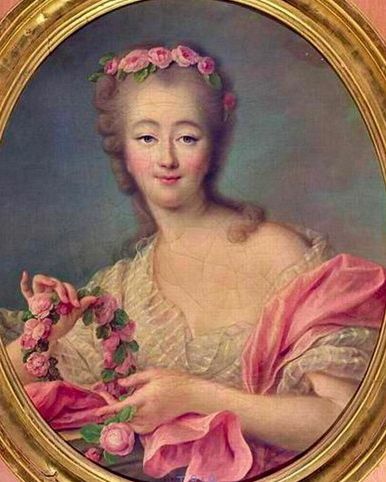 Madame du Barry‘s favourite scent (she’s on the right) came from an Italian perfumer, Giovanni Maria Farina: Aqua Mirabilis, the original eau de Cologne (as it became known as), upliftingly scented with bergamot, neroli, lavender, rosemary, in grape spirit. 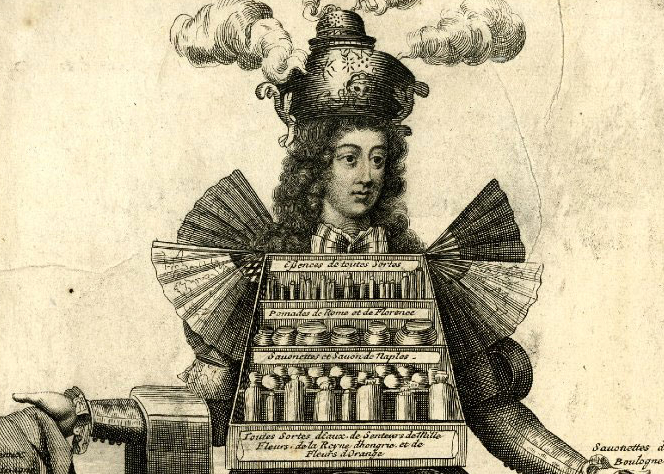 The ‘perfumer-gantiers’ – the glover-perfumers – achieved even greater status and power. In recognition, they were granted additional patents by Parliament. Vast amounts were being spent on perfumes, by the aristocracy: at Choisy, where Madame de Pompadour became famous for raising elegant living to even greater heights, perfume was consumed on a stupendous scale: it became the main item in the household budget. The competition to supply ‘the Perfumed Court’ with scented goods was seriously ferocious. Montpellier and Grasse went head-to-head in a battle out to outdo each other and claim the Royal warrant. These regions experimented with growing newly-introduced fragrant plants – such as the bigaradier, a citrus tree planted on the Îles de Lérins, in the bay of Cannes. The hills and valleys of Provence were soon filled with the delectable scents of carnation, jasmine, violet, rose and lavender, many of which flourish till this day around Grasse – which is still the heartland of perfumery. 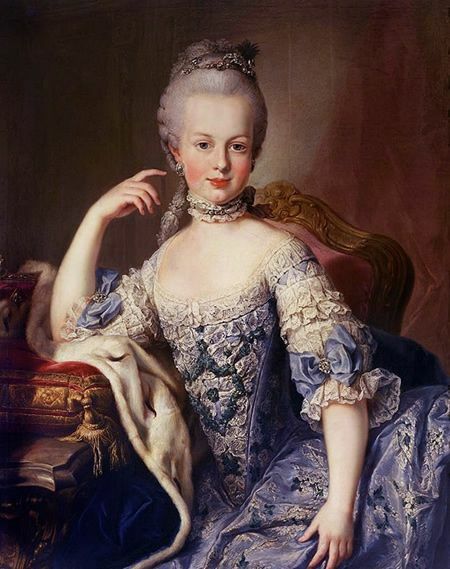 Later Marie Antoinette – married to Louis XVI – was the glamorous figure every perfumer longed to please. That plum job went to a perfumer called Jean-Louis Fargeon, born in Montpellier in 1748, where he was later apprenticed to his father’s modest perfumery. But he dreamed of the glittering Court of Versailles, and was propelled by his ambition, opening an elegant boutique which attracted aristocratic customers like moths to a fragrant candle. Through the creation of scents for the French nobility, Fargeon caught the Queen’s attention, met with her at the Trianon Palace – and that was that. For fourteen years, until the French revolution, Fargeon served as her personal perfumer, creating ever-more-lavish scents to match her personality and her quixotic moods. Two of these included ‘Sillage de la Reine’, fused from tuberose, jasmine, orange blossom, sandalwood, iris and cedar. ‘Jardin Secret’ was fragrant with bergamot, cardamom, jasmine, incense, rose, sandalwood, vanilla, patchouli, amber and tonka bean. (And what we wouldn’t do to be able to smell them now…) If you’re interested in reading more about Fargeon, we recommend a book called A Scented Palace: The Secret History of Marie-Antoinette’s Perfumer – click here to find it. By now (probably to everyone’s relief), bathing was most definitely in vogue. One famous beauty, Madame Tallien, went so far as to bathe in crushed strawberries, when in season, and to wash herself with perfumed milk. Then the Revolution happened, which was a turbulent time for perfumers – but they had a new champion, Napoleon Bonaparte, who had a standing order with his perfumer for 50 bottles of cologne a month. You can read about it here.